Toys for kids, and those who are kids at heart. Just in time for those windy days of March, Manhatten Toy released a new line of bug theme flyers. The new Soar & Spin kites feature 2 ways to fly. Kids can throw it or spin it around. Each kite set comes with 1 flyer and 1 holding stick. 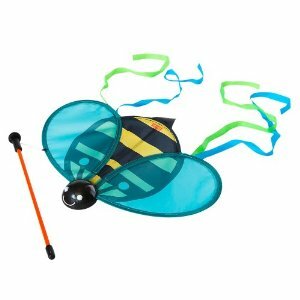 These ultra light kite flyers are made up of a nylon body on a hard plastic frame with a 3D plastic head.